Reveillon is one of New Orleans’s oldest Christmas traditions. Decided to spend it at Galatoire’s this year. Here’s the course-by-course rundown! Escargot Yvonne: Escargot (i.e. snails) cooked with the usual garlic and butter to a nice soft but pleasantly chewy texture. Artichoke hearts and white button mushrooms to add some volume. And in a nice touch, some sliced grape tomatoes to brighten the dish with both color and acid. Country Lentil Soup: A surprisingly light soup that really hit the spot. There was duck meat in it. Supposedly there was foie gras in it also, but I didn’t taste or see any. 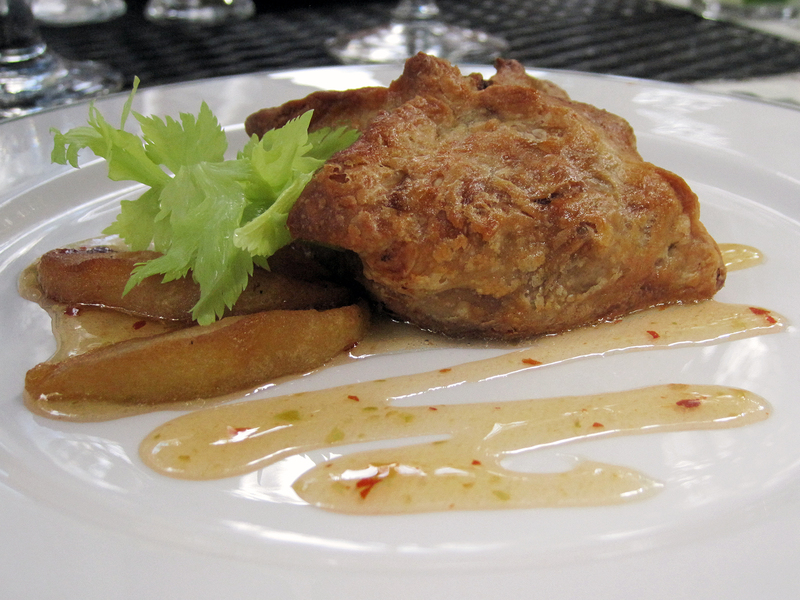 Fried Oyster Clemeanceau: Another French Quarter classic. There was a piece of shell in my dish, but the cooked-till-they-melt peas, Brabant Potatoes, and of course, more mushrooms more than made up for it. Sampled all three desserts: Custard Cup needs to either be less like scrambled eggs or sweeter to emphasize that it’s a dessert. Bread Pudding was too dry and chewy, but the caramel sauce was perfect. Lemon Tart was the winner – No criticisms with it at all. In summary, Galatoire’s continues to be a quarter establishment. The plates are coated in butter when you finish eating them, but that’s just classic French. Also had cocktails throughout the meal: Bourbon Milk Punch with the first course, Poinsetta with the soup, and French 75 with the oysters. Decided to skip the Café Brulot for dessert. Reveillon menu is available until December 24. Gents, Gal’s requires a jacket at dinner service and all day on Sunday. Sunday: 12 p.m – 10 p.m.
Tuesday – Saturday: 11:30 a.m. – 10 p.m. This entry was posted in Food and tagged booze, caramel, carbs, duck, fried chicken, garlic, lentils, mushroom, seafood, where'd ya eat?. Bookmark the permalink. Naturally we took advantage of Bayona’s cocktail menu and wine list. (I’m not going to bore you with a list of all we drank.) 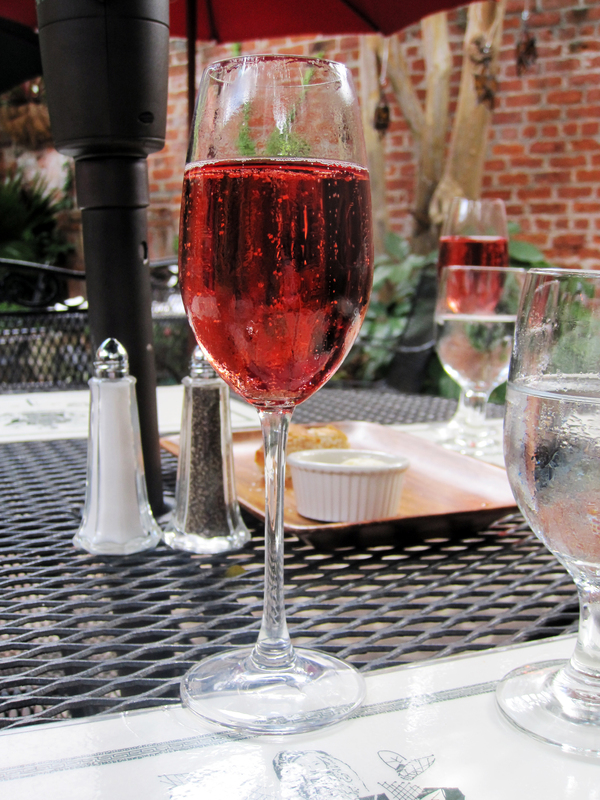 But since the meal was a celebration, we started with sparkling wine. 2010 Domaine de la Manarine Cotes du Rhone. Lady’s choice. The rosiest rosé I’ve ever seen. The cream of garlic soup is one of the mainstays on the Bayona menu. Creamy and rich but mostly garlicky. So if you’re a garlic lover or a lover of “cream of” soups, definitely get a cup. The Bayona Salad is their house salad. Nothing particularly exciting, just proof that a simple bowl of mixed greens, good cheese (Parmigiana Reggiano or Great Hill Blue), and vinaigrette can be all you need. One conspicuous absence from the menu was sadly the veal sweetbreads. They’re Chef Spicer’s signature, usually available appetizer-size and entrée-size. On the bright side, now I have an excuse to go back. I did try the fried rabbit liver salad, which came with beets both red and yellow, arugula, and balsamic vinaigrette. Tara and I were musing over the fact that most people who don’t like certain ingredients (beets, brussel sprouts, etc) have just never had them properly prepared. An aside on Chef Spicer: She was at the restaurant, and we admire how she’s the kind of chef who genuinely seems to love being in her kitchen. Many chefs of her caliber and success tend to end up enjoying their celebrity with TV and other public appearances. (There is nothing wrong with this.) But she was also at Mondo when we dined there last month. When she does enter her dining room, it always seems to be in an inconspicuous “I’m checking to see that service is going well.” There’s no grand entrance or look-at-me, tell-me-how-awesome-my-food-is fanfare. Anyway, it’s awesome that her passion for cooking overrides the perks and benefits of being a successful chef. She is a very cool lady. Smoked salmon, like actual meaty smoky salmon, not the lox you buy in a deli, potato pancakes, horseradish sour cream, and choucroute made an appearance also. A skewer of swordfish and scallop on a bed of lentils and a drizzle of pesto was really good. It’s the kind of dish where I like all ingredients involved, so I’m inherently biased. It’s nice to see lentils not cooked into mush. One of the two chunks of swordfish was a bit dry, but that’s usually a risk in cooking the fish. The other was cooked perfectly, as was the scallop, seared on the outside and medium rare inside. For obvious reasons, I’m particular with pasta but I did enjoy the fettucine with shrimp, andouille, roast tomato and garlic cream sauce. That combination of ingredients is obviously not a traditional Italian one, but the al dente of the pasta and the homemade andouille showed a mastery of Italian technique with the same use of local ingredients that Italians pride themselves on. And the main reason Tara and I chose lunch at Bayona: Smoked duck and peanut-cashew butter with hot pepper jelly. The dish is a play on childhood favorite peanut butter and jelly with our favorite protein mixed in. It’s usually served as a sandwich but was baked into a puff pastry this time. Very rich. Full of protein. It was garnished with celery leaves, a clever reminder of another grade school memory: Celery sticks dipped in peanut butter. I wouldn’t have minded a little acid, but if you’re going to be decadent, why not? We had one each, figuring sharing might be a problem. 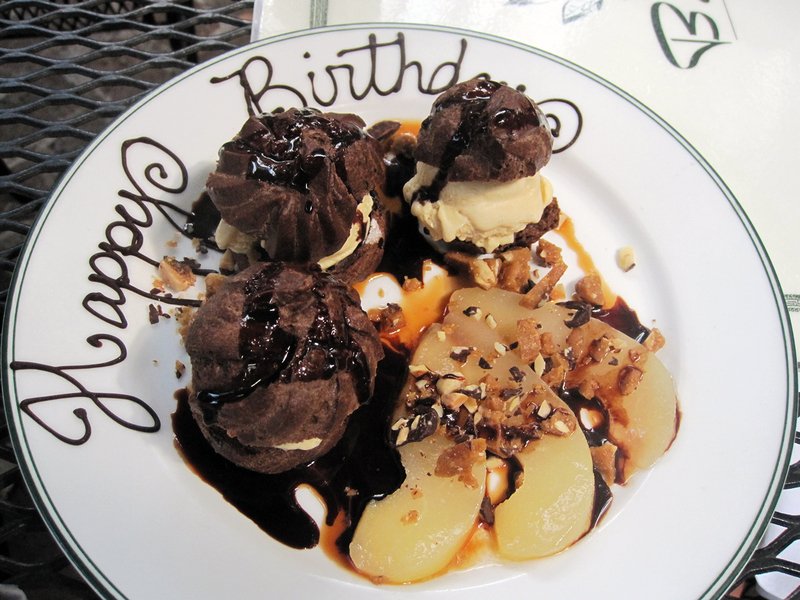 For dessert we had chocolate profiteroles, pear slices, caramel ice cream, and butter crunch toffee. This was just a great mix of different levels of sweetness and textures. The photo looks a hot mess – my fault – but I promise the dish looked and tasted delicious in reality. This entry was posted in Food, il giornale, Where'd ya eat? and tagged balsamic, beet, booze, caramel, carbs, cheese, chocolate, duck, garlic, ice cream, JigglyJuggs, lentils, nuts, pesto, rabbit, salmon, scallop, shrimp, smoked, spicy, wine. Bookmark the permalink.